When the world's first coins were produced in the seventh century B.C., they were simply a measured and guaranteed amount of precious metal, gold or silver, of a known purity. Almost three thousand years later, at the beginning of the twentieth century, the currency value of most coins was close to that of their intrinsic precious metal content	, their bullion value. Gold has almost always been the preferred security for most currencies. Governments and central banks store much of their gold bullion in the form of 400 ounce bullion bars, but also maintain stocks of gold in the form of gold coins. For Great Britain, the obvious choice of bullion coin is the gold sovereign, and many other central and commercial banks keep a proportion of their gold bullion in the form of British gold sovereigns. The start of the first world war caused a major change in coins and currency the entire world over. Countries moved their currencies off the "gold standard". Within a decade, most countries converted to using paper money, and a token coinage, token meaning that the underlying bullion value would be much less than their face value. It is only natural that at times of uncertainty, people everywhere seek to protect their assets from potential disasters. Whether it be fears of the millennium bug, worries about the "Euro", the end of the pound sterling, the collapse of the rouble, there are sound arguments for retaining at least a small proportion of surplus wealth in an ultra secure investment form. Gold has performed this traditional role since before the first coins came into existence. As one of the worlds oldest, most historic, and most recognisable gold coins, the gold sovereign makes an ideal bullion coin. Sovereigns weigh 7.98 grams and are made of 22 carat gold (carat means 1/24) or 91.66% pure, and therefore contains 7.315 grams or 0.2353544 troy ounces of pure gold. The only disadvantage of the sovereign as a bullion coin, is that the new breed of bullion coins, from the krugerrand which was introduced in 1968, onwards, are easier to calculate their gold content because they all contain one troy ounce or a simple fraction of an ounce. The great advantage of sovereigns is that they are an attractive and much loved coin with a rich tradition and history. Single coins command premium prices for use in jewellery or as gifts for special occasions such as christenings, golden weddings, coming of age, and even just as an attractive jewellery item in its own right. Since 1964, we have been active and competitive bullion dealers. 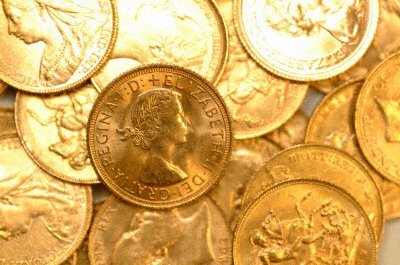 We are always keen to quote buying or selling prices for gold sovereigns in any quantity. Our bullion rates generally start at about 10 pieces. Bullion coins will be in normal acceptable condition. While some may be in near mint condition others will show considerable wear. All will be guaranteed genuine, and in reasonable condition. Pleas do not expect bullion coins to be in selected condition, for this you would need to buy selected grade coins. Because bullion sovereign prices fluctuate with the underlying gold bullion price, and also with supply and demand, it would be very difficult for us to quote accurate updated prices on our website. Any bullion prices quoted are meant to be taken as an indication only. Instant sovereign collections at bullion prices for new collectors or investors. On 1st January 2000, the Royal Mint unilaterally started to change the meaning of the word "bullion", probably as a convenience for its marketing department. VAT Abolished On Gold Sovereigns - Now Tax Free! 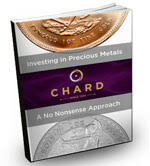 For half sovereigns, krugerrands, guineas, and most other coins, visit our original web site Chard - 24 Carat. For modern bullion gold coins, such as Britannias, krugerrands, maples, philharmonikers, eagles, nuggets, and kangaroos, please visit our new Tax Free Gold web site. Gold Sovereigns Are Now Tax Free!